Rosanne writes, " I hope my question will turn out to be a simple one. I already have 4 sewing machines. However, none of them can accommodate sewing that is rather thick under the presser foot. Because I have recently started a sewing business at home, and I'm starting to get more Home Dec jobs, I'm realizing that I should start searching for a (used) machine that is both strong and handles thicker sewing. Can you please tell me your opinion of what I should be on the hunt for? This comes down to if you want to devote the space to an industrial or keep it portable. If going industrial most machines will do what you're asking without complaining. Generally I find the needle gives way long before the motor stalls. Depending on your area a straight stitch industrial can be had for $100. I've never spend over $100 and I have 4. If you're looking for portable then perhaps an older Bernina (less than $200). An electronic machine will give you consistent punching power but a mechanical one will be "smoother" to use. What specifically are you going to be sewing and what is your budget? Rosanne writes, "Space would be an issue for me, I'm afraid. I know that industrial machines are strong. I had a "factory" job (It was actually in a home.) once, working with an industrial machine. I might be able to find a place for it if I eliminated one of my machines that's in a cabinet. However, I'd rather go with a portable. You could label my business as "eclectic". Although by far, the majority of my experience has been with garment sewing, I find I really enjoy home dec, & also repairs. I've taken custom slipcover classes, and have even reupholstered some couches. As a result, I've been getting all types of sewing work brought to me. I had a very tough time sewing some pinch-pleated, & swag & jabot, style window treatments when I get to the areas where the material has a few layers of folds. Then it takes a great deal of SQUEEZING, and turning the wheel by hand to get through it. Recently, I was given a padded golf-bag strap to reinforce, and none of my machines would do. That's when I decided that I'd better see if I can find another machine for those situations, because I'm sure there will be more. I think we could swing getting a machine $100-$200. Hi Rosanne, Ok so I would say the biggest issue you'll have is getting enough lift from the foot to get bulky stuff under. If you're using the right size (as in not too big) sharp needle going through the layers probably won't be a huge problem since home dec is usually a lot looser weave than cotton (like denim). Unfortunately I don't think there's one good answer here for you. Here's what I know that could be of relevance to you. High shank foot machines tend to have a bit more space under the foot but no guarantee. The shank size really should have nothing to do with how far it's lifted but they seem to correlate anyway. A machine with a good hand wheel is essential since you'll be turning it by hand quite a bit. Nothing makes me more irritated than a small hand wheel with nothing to grab. Bernina machines with the knee lift (not the knee power, that's older) will drop their feed dogs when the foot goes up allowing fabric to be more easily moved under the foot. It seems like it wouldn't matter but the difference is apparent when moving to a machine without this feature. "Electronic" machines are defined to me as machine that has consistent punching power no matter what speed. These machines will have smaller hand wheels because you're not really supposed to use them for advancing the stitch. They're great until you get to something they can't punch through and then they're a big pain. The more features a machine has the less "free" the movement. The most direct path for power from the motor to needle is what you want. You're looking for a 1970s flatbed zigzag kenmore with the lever to adjust stitch length not the knob and external motor. Often the best ones are the green ones. I'm not super fond of the zigzag selector knob on this model but it's got everything else. This model also has a blind hem stitch which is extremely handy for curtains, maybe even a left hand needle position which is also quite nice. The external motor will allow you to adjust the belt as necessary and makes motor replacement easy if necessary. These Kenmore machines often came with a 1.2amp motor which is about as good as it gets. I saw a 1.5amp once but only once and it was a Consew. These can be had anywhere from free up to $100. Most were designed for cabinets so you may have to switch out the foot pedal if it's set up for knee. I didn't even mention the Sailrite machines because even used they fall well outside the budget. Another wild and crazy idea might be using a treadle... Plenty of power, not sure on the lift, checking.... yeah nothing special. The hand wheel on this one is great but it has the knob for stitch length, no good. Often you can switch the hand wheel from one machine to another so it's worth keeping an eye open for orphaned machines to strip for parts. What would your suggestions be for Rosanne? Hammering thick seam intersections flat is probably the best tip I can offer regardless of machine. This is a very common issue for a lot of sewists. Oh, I don't know, those old 158 series Kennies may not look glamorous, but they are such workhorses! The extra little lift you get on the presser foot, it can be a lifesaver when the hammer has walked away with the screw driver out of the "junk" drawer. I hadn't sewn on one in years but just picked up a 158.14301. Impressed me all over again. How do Necchi's compare to the Kenmore you mentioned? Is it "industrial"-strength enough? Brian, I had this problem and ended up looking for (and finding) a Kenmore 158.17530. The advantage to this particular machine, and others like it, is that it has a dual belt drive that essentially "gears down" to provide extra torque. This is a short-shank Kenmore, and Kenmores in general have a high-lift presser foot. I'll put up a page on my blog some day soon with a list of the Kenmore machines I've found that have the dual belt system. It's not perfect (Sailrite is something I'm considering) but it's much better than my previous old single belt Kenmore. 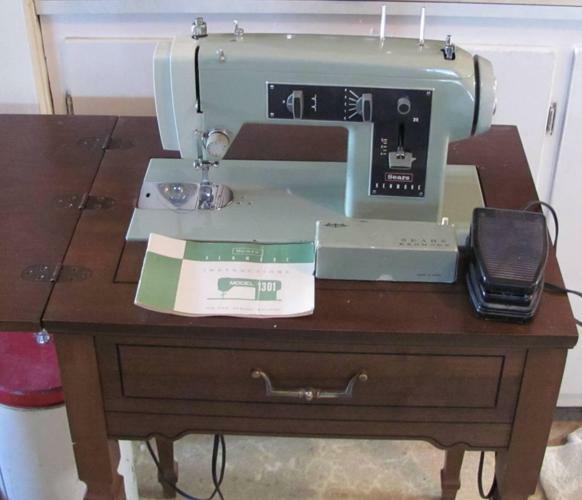 Hi Brian, I came across your youtube on threading a singer I am just starting out sewing and I came across a 1956 travel singer at the Goodwill and I think I am not threading the machine right because the thread keeps snapping. I am not sure what I am doing. I can hardly thread a regular sewing machine let alone this one. What am I doing wrong. This is a very interesting question and answer back and forth for anyone who is interesting in purchasing a sewing machine. There really is quite a bit of information in your answer. There are a lot of considerations to weigh including value, cost and space. This seems like a very detailed and informed recommendation. Hey, Brian -- new to sewing and I'm a bit intimidated by you and everyone else who knows all this stuff. I'm beginning to collect machines and I'm wondering if you could post a tutorial video re. sergers (what they are, what they do, how they work, 4- vs. 5-thread, etc.). Hope I'm not too late for comment. Just discovered you while researching great vintage sewing machines. I got a Kenmore 158.13033 (1303) for almost free. But, it is missing a bobbin case and has only one presser foot and no attachments. The bed and machine has lost its shine (and has some rusty looking dots) It is very stiff and the wheel does not move, the screw that holds the needle bar is off center and who knows what else. I am more than willing to learn on it and try to get it loose, but how much money should I put into the machine to try to get it working. Was it a good machine to start with? (The 1303 has the dial stitch length; should zig zag and hem stitch. They are good. I have two sewing machines from my mother, but I really don't know thoroughly about them. Hi Brian, I just found you & am so excited to learn! I love the Kenmore's from late 60's through my newest 158.1980 machine. #158.1757 stitch modifier lever doesn't work & when I check inside- it's not connected to anything. #1980 re-assemble the bobbin(drop in) case I took apart to clean. I 'think' I put it back together right but I can't get it to do even a straight stitch without the bottom thread 'bunching' up immediately. If you can't help with this, I would appreciate any links you would suggest. Thanks!! Hi, Brian! I just stumbled upon your blog which is awesome. I hope you will post more, because your posts are very informative. I saw your tutorial about using a hemmer foot which has been immensely helpful to me. I have an old Singer "clone", circa 1950-ish. Do you have any information on how to use a flat fell foot correctly? Thank you! Hello! Just found your blog. I wish you would post more. I am a vintage machine lover and am starting to collect myself. Hey there, I have a Kenmore 158.220 with a 1.2 amp #2508 motor. I couldn't get the motor apart to change the brushes...so thought it may be cheaper to replace the motor than take it in for repair. But I am having trouble finding a motor that size. Would you recommend a universal .9 or 1.5 amp motor instead? Born from old factories and industrial warehouses, today’s industrial style interiors have become very chic and desirable, whether or not they are in a truly industrial space. While this decor trend became popular at the time when urban areas stared converting lofts to living spaces, today many a suburban home features industrial decor.